Iowa is a dark horse candidate to win the Big ten West Division in 2014. Last season, the Iowa Hawkeyes returned to a bowl after missing out in 2012. They lost to Northern Illinois, Michigan State, Ohio State, Wisconsin and LSU 21-14 in the Outback Bowl. The season was highlighted by wins over in-state rival Iowa State, Minnesota, Michigan and Nebraska. With 13 starters back, Iowa fans think the team is primed to make a run at the new Big Ten West Division title, but Wisconsin and Nebraska will be tough competition. Last season, Iowa rushed for 180 yards a game and passed for 197 yards per game. The offense averaged 26 points a game. Most of the starters are back on offense and they should improve on offense. Quarterback Jake Rudock returns to run the offense. He completed 59% of his passes for 2,383 yards with 18 touchdowns and 13 interceptions, along with 67 carries 218 yards and 5 touchdowns. He was hampered by a knee injury late in the season but did not miss a game. Rudock needs to cut down on the interceptions in 2014 in order for the offense to improve. Sophomore C.J. Beathard could step in if Rudock is injured. The top five rushers return for Iowa. Marc Weisman had 227 carries, 975 yards and 8 touchdowns. Jordan Canzeri had 74 carries for 481 yards and 2 touchdowns. Damon Bullock had 118 carries for 467 yards and a touchdown, along with 20 catches, 173 yards and a touchdown. LeShun Daniels could also get some carries. 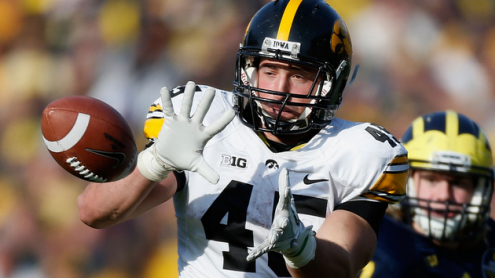 The Hawkeyes must replace tight end C.J. Fiedorowicz, now with the Houston Texans. He had 30 catches for 299 yards and 6 touchdowns. Receiver Kevonte Martin-Manley does return after making 40 catches, 388 yards and 5 touchdowns. Tevaun Smith had 24 catches for 310 yards and a touchdown. Ray Hamilton and Jake Duzey look to take over at tight end for Fiedorowicz. Iowa returns three starters on the offensive line. Left tackle Brandon Scherff is a potential All-American. Offensive line is usually a strength for Iowa and this year should be no exception. Iowa was #6 in total defense nationally last year giving up just 303 yards per game and #9 in scoring allowing just 19 points a game. Only 5 starters return so a drop-off could be expected. Senior tackles Carl Davis and Louis Trinca-Pasat anchor a strong defensive line. Davis was second team All-Big Ten last year. All three starting linebackers are gone including standout James Morris. Senior Quinton Alston backed-up Morris for three seasons and finally gets a chance to start. The secondary must replace All-Big Ten corner B.J. Lowery. Sophomore Desmond King had a breakout freshman year with 69 tackles and 8 pass break-ups. Safety John Lowdermilk, like King started every game last season. Walk-on Marshall Koehn and freshman Mick Ellis will compete to replace kicker Mike Meyer, a four year starter. JUCO transfer Dillon Kidd will challenge incumbent punter Connor Kornbrath. Martin-Manley will return punts again, but there will be a competition for the kick return job. Iowa opens with three home games against Northern Iowa, Ball State and Iowa State before traveling to Pittsburgh. In Big Ten play, Iowa travels to Purdue, Maryland, Minnesota and Illinois. Indiana, Northwestern, Wisconsin and Nebraska come to Iowa City. There is a chance they could be 10-0 before closing with home games against Wisconsin and Nebraska. Road games at Pitt, Maryland and Minnesota are no picnic though.